74 • March 2018 • S I G N & D I G I T A L G R A P H I C S ARCHITECTURAL AND ENVIRONMENTAL Laser Logo Techniques Cut acrylic with a brushed gold finish B Y R I C K W I L L I A M S Shop Talk ing it with an adhesive film before cutting. However, it could not be overlaid with metallic gold vinyl since cutting through some vinyl with a CO 2 laser emits deadly chlorine gas and is prohibited, it's best to be safe. Fortunately, some of the metallic films, especially "mirror" and "brushed" finish films are not vinyl, but are made of poly- ester plastic instead, which, at least to my knowledge, are OK for laser cutting. The gold we settled on was pretty convincing and had a brushed gold finish that would catch the light more than a glossy or mirror gold version. So, the first step of this job was to cover enough black acrylic with a brushed gold metallic film, hopefully with no flaws or dust imperfections, which metallic films show mercilessly. Once covered, the actual cutting on the laser only took a few minutes, and left the edges a lovely polished black only enhancing the metallic gold surface color. We had some 3/16" clear acrylic, and using it we cut some small round spacers, half of them with holes and half without. Because our lettering was a script font, and the lines were fairly thin, our clear spacers or mounting hardware did need to be quite small to be hidden behind the strokes of each letter and the thinner elements of the logo. Our clear acrylic circles or spacers were only about ¼" in diameter. Small paneling nails were selected as our sharpened studs R ecently a local assisted living facility asked us to do sev- eral projects for them, mostly outdoor and indoor versions of their custom logo. Their outdoor logos were waterjet-cut aluminum and powder coated a dark green color, but their indoor logo was to be done in some type of metallic gold finish and would be a decorative element to mount on a wall behind the reception counter. Other than color, the client did not specify what the indoor logo was to be made of, what thickness, or any other specifics at all. 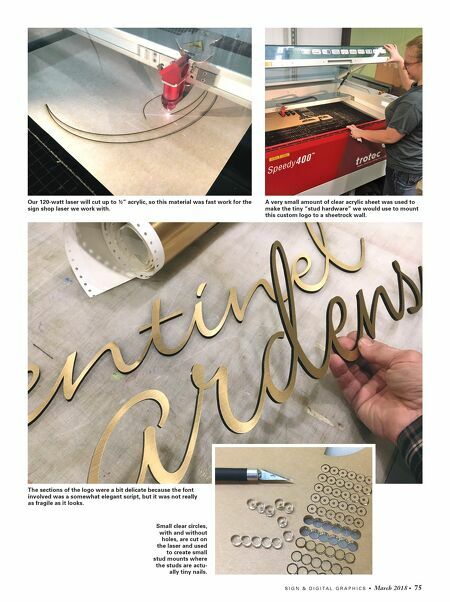 So, with that much latitude, I thought this would be a good project for our sign shop laser cutter, turning basic sign shop materials into something attractive, easy to install, which could be produced quickly, efficiently and profitably. We had some black acrylic, in .187" thickness, which a 120- watt laser like ours can easily cut. Our Trotec Speedy 400 laser will actually cut acrylic quite well in thicknesses up to ½". But, if we wanted a nice metallic gold surface, we would be cover- Rick Williams owns Rick's Sign Company, a commercial sign shop in Longview, Texas. He has been in the sign industry since 1973 and documenting the sign business since 1986. Contact him at RickSignCo@aol.com. 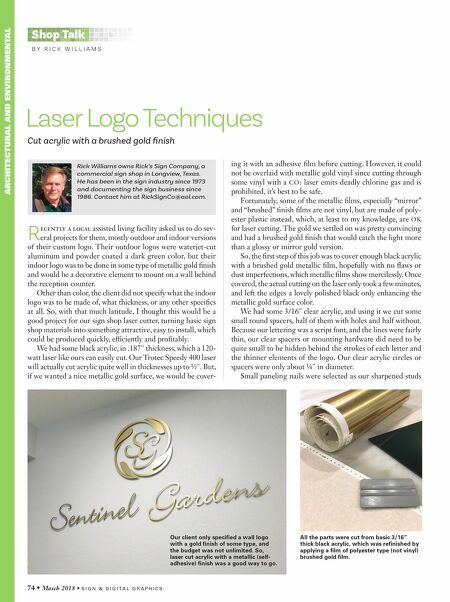 Our client only specified a wall logo with a gold finish of some type, and the budget was not unlimited. So, laser cut acrylic with a metallic (self- adhesive) finish was a good way to go. All the parts were cut from basic 3/16" thick black acrylic, which was refinished by applying a film of polyester type (not vinyl) brushed gold film.